With the pain of the race still very fresh (read: I am immobilized) I thought I'd jot this down. You know, because it's not like I can get off this couch. Yet. I ran, I ran, I cried because I got cramps that felt like labor and my body freaked out and I didn't know what to do, I got myself together, then I ran faster. The course had 6400 vert gain and I was able to run up all but one major hill feeling good. I beat my goal time by a half hour, came in at 10:06, taking over 1 hour and 20mins off the female course record. I was first female and 4th overall, but those numbers mean little to me since there were only 30 people racing. Much more excited to have a 10:06 100k PR on a course with over 6400 vert! I was both excited and nervous for this race. While I've been running more than ever all summer, it was all play. No speed work. No flat runs. I realized recently that the last time I did a long run without bagging a peak or pacing someone was early July! Not really race specific training. This race had 3 major climbs: two smaller, shorter (1 steep 1 not as steep) and one really steep really long (3 miles) climb. Other than that, the race was entirely flat. That terrified me. All I've been running is vert, and I worried how my legs would do actually running. They didn't know what turnover was anymore. 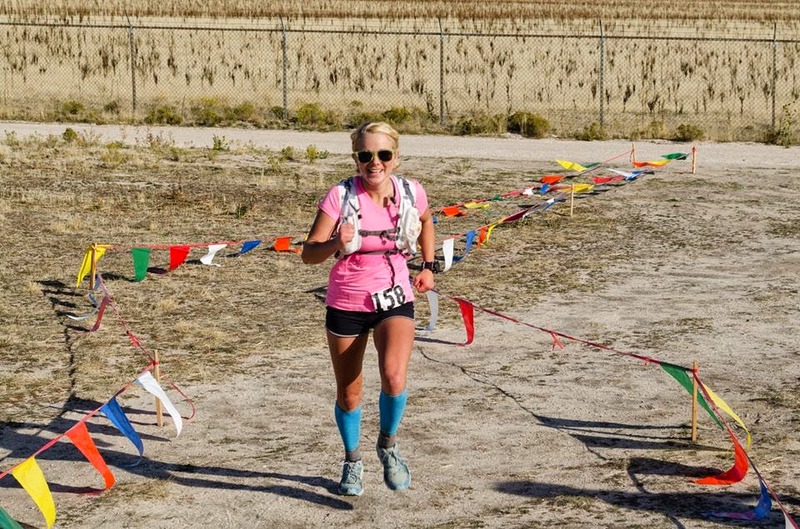 The Antelope Island 100k course is a 50k loop on Antelope Island, two laps of each 3200 vert. This course takes the runners on the west side of the island, which is usually closed to the public. I love the rocky crags and hills on the west side. This year, instead of packing and getting my mental game together, I bought buffalo earrings and painted my nails for the race. This was more fun that pre-race prep. Fortunately a day or two before I finally got drop bags together, made my power balls, and cooked all my bacon. I didn't really stop pretending I wasn't racing til we all lined up at the start line. Even then, I promised myself I was just going to jog the loop once, warm-up, and THEN if I felt like picking it up I could. I know I'm much better at being consistent with my slow pace than I am at running fast. So, off we went! The moon was so bright, reflecting off the water all around us, that it was perfect and confirmed my decision to not run with a headlamp. I was chatting with my good buddy Zac as we started jogging down, until I realized we were running a sub-8 minute mile. Ha! That's a joke. I told Zac if he was going to run that fast I would not follow suit. I pulled back and he took off. That was the last I saw of him before the finish. I ran with Nate Younger, talking back and forth about different things, as well as with a man named Dimitri who came all the way from New York (and took a taxi cab to the start). I'd pull ahead a little here and there and then back off, I was enjoying Nate's company and knew I might not have company the entire race. We hit our first downhill around mile 6 or so, it was long and technical. I was gone. It was on the downhill I picked off one or two of the guys that had taken off in front of me earlier. I reminded myself of my promise- not hunting anyone down til mile 40. I was surprised at how much of the vertical gain I was able to run. When I ran the 50k last year I walked all of the climbs, and this year they felt so slight on my mountain trained legs I flew up them. I tried not to be disappointed by the knowledge that at mile 14 I was on an 11 min mile average, which would put me well over my 10:30 time goal. The downhill to the next aid station I picked it up, and moved quickly on the flats too, making up 10 minutes or so in 6 miles and getting back on track. I continued to make up time on the next 10 miles. It was here that things got ugly. I had never raced on my period before. I didn't know what to expect. At mile 23 when cramps spread across my hips into my low back, seizing, I felt like I was in labor. It was here that I bonked (usually my first bonk on a race) and I was emotional and crying in pain and in the unfairness. I tried to drown it out with very loud music, with focus, with running faster and focus on that pain, but the pain in my hips and low back was so forceful and unrelenting I couldn't ignore it. I came in to the start/finish (mile 30) at 4:40, and left with my crew/pacer Jim Milar at 4:44. I knew he didn't want to hear about it but I told him I needed to whine to someone for a little bit. He suggested painkillers, something that was on my mind already. I've had bad experiences with ibuprofen (can't keep it down while running) and had never tried Tylenol. He offered a few times over the next hour when he'd hear me cry out in pain, reminding me that even if I threw it up it wouldn't slow me down anymore than the cramps were. But I'm stubborn and insisted on waiting til mile 40. I didn't want to ruin a good stomach, what I felt like was the only thing going for me that day. RD Jim Skaggs, thanks for putting on a great race! I dropped Jim M on that same first long downhill and he never really caught back up. I insisted and running the climbs, with the hope that I could walk all of the last, hardest climb. From miles 40-43 I walked up that climb, in unbelievable pain, unable to move more quickly. My 2nd 50k was just over 30mins slower than my first... and my 2nd time up that climb was over 20mins slower than my first. It was where I lost almost all of my time. 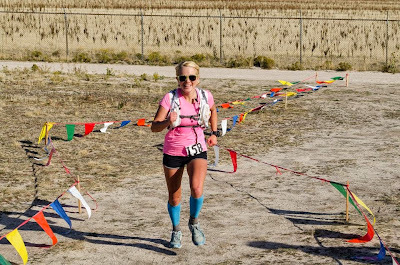 When I got to the 43.5 aid station I was desperate for the cramps to just stop. I didn't know if Jim had taken a shortcut or if I'd see him again, so I begged the volunteers for pain killers. Sweet friend Missy gave me some of her personal stash. "Take two of these," she goaded, and I willingly swallowed both. Then she told me that was 1,000mg. WHA?!?! I'd never taken more than 400mg before. This would be interesting. But I knew she was a nurse and she knew my size and I decided to trust her. I ran into (literally) a herd of bison on the trail. There was a mama and a baby sitting right on the trail, staring me down. I was nervous and walked through the herd, every animal with it's eyes on me and its head down. I tried to keep my head down (not sure why, just followed their lead!) 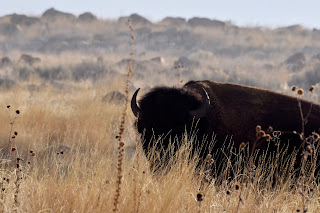 Bison are my favorite animals, but I don't want to touch one! The next aid station was 4 miles away. I'd see how long it took to run there and see how I was doing. It took me 28:45 to get there. In my ultrarunning-bad-math-head I thought I was running 8's, not 7:11s. I was stoked. I had just made up 8 minutes! I could hit my goal! I ran past the aid station and kept moving. My hips started to ache again but I was smelling the barn door. I mentally focused in on reaching the fence, where I would let myself walk a bit before running the last stretch of downhill. I was moving in the 9ish range on what was for me the hardest stretch of the race- dry, open, nothing around, and perfectly flat. Getting close to the gate I got really close to the 3rd place male. I had run with him earlier, and he had been working hard all day to keep me behind him. "Mike!" I hollered. He jumped and turned around. "Get moving. I don't want to take your podium finish away from you but I will if you don't start running. I know you can bring it in. So go!" He saw how close I was and with my threat to take his finish from him, he was running scared. He stopped taking walking breaks and got moving. It made me happy to see him hauling. I finally got to the fence, and realized I could maybe finish around 10:15, maybe 10:10 if I tried really hard. I laughed, because I thought those times were physically impossible for me. I was elated. I hit the gravel downhill and wanted to give it all I had. If running my hardest now could bring to 10:12 I wanted it. I saw the finish line and I was at 10:05 on my watch. I was fist pumping and hollering, I was so happy. I came in 10:06 with a big smile. 17 miles ago I was worried about making it under 11 hours, and here I was just over 10. I had a great race. The 20 miles of misery were entirely unnecessary (thank you body) but took my focus off the race and gave me a good, needed lesson on pushing through pain with focus. I am so unphotogenic. Oh well, it makes you (dear reader) happier that you're more photogenic than me. So enjoy it. Again, thanks to Jim for waking up at 3am to drive me out there and for crewing and pacing. Also thanks to all those who came and watched the finish/congratulated me, including my co-worker Dr. Duncan and his family, Leslie, Andrea, and others. My biggest fear now is that more people will get the un-due notion that I'm fast. I ran with a new friend recently and he was nervous. "I can probably only run 9 min miles on the (dirt) road. I hope that's not too slow." I was thinking, 9 min miles?! Uphill?! On a ROAD? What is this, a tempo run? That sounds WAY too fast. lol! I'm not fast and I've never been fast, but I pride myself in being consistent, and in being able to stay on a pace for more than 50 miles without much loss. As I proved to myself yesterday, I'm pretty good at 10+ minute miles. :) Just don't expect anything faster than that, my pace doesn't increase on shorter runs! Well, that's it! I surprised myself (a lot) and learned a bit more about digging deep and pushing hard. All in all a great training race and learning experience! Great report, great race! I've said this before, but you are young and just starting to tap into your ultrarunning potential. I think that you'll be surprising yourself for years to come. So proud of you! as long as they're good surprises.... ;) Thanks! Great report. I knew you'd be going into a tough day on your period, but you pushed through and crushed a new Course Record. Congrats on the win. Looking forward to what's next.